Now DJI is introducing its smallest, smartest and most approachable drone yet, the Mavic Pro. With the ability to fold up into a water bottle-sized package and a starting price of $999 (£999, AU$1,689), this tiny drone comes priced right and with all the smart features of DJI’s other models – plus a few new ones to boot. Ultimately, the greatest barrier to entry with drones has been intimidating controls, and DJI is trying to change that with a simpler and just-as pocketable solution. We got to try this out of ourselves, taking control of this pocket rocket just outside Lisbon. While it can be simply used with the bundled controller, with all the flight info you could wish for displayed onto the built-in screen, we had it partnered with an iPhone 6S and the latest DJI app installed, allowing us to take full advantage of the gimbal controlled camera feed displayed on the screen, along with a plethora of telemetry round the edges of the frame and also the controller itself. This was set-up by opening the two hinged side panels at the bottom of the controller where you can snuggly place your smartphone in-between the rubber grooves (you’ll probably want to remove it from its case for a better fit), while there are a range of adapters to make a hardwire connection to the controller – no Wi-Fi pairing here. This means the controller is very easy to set-up once you’ve released the two antennas at the top (these click nicely back into place when being stowed away), and you’re ready to go. All you have to do now is pull out the two arms at the front, the two from behind, a double-press of the power button (this avoids it being knocked/pressed when it’s in your bag and draining the battery) and you’re ready to take to the sky. No need to fan the rotors out as the force generated when the motors whirr up will do this for you. For new users, this doesn’t have to be as daunting at this sounds. The controls are incredibly tolerant of your inputs, while it remains perfectly stable in midair when you take your hands away from the controller. Even in some windy conditions when we took it up further than the treeline it still remained pretty perfectly balanced – though it did warn us of the adverse wind speed. 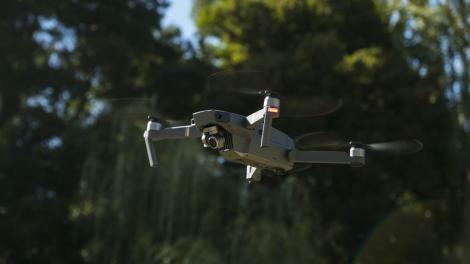 There are clearly marked auto controls to get the drone in the air, as well as returning it to where it took off – the Mavic Pro will take photos with its downward facing cameras and using this with the GPS data, will know exactly where to return too. In our hands-on time with it, it was incredibly precise, and certainly takes the stress out of landing if you haven’t got the confidence to get it back yourself. As we’ve mentioned, you can simply use it with the supplied controller, but we’d urge you to hook your smartphone up to it – the feed you get back is incredibly cool, and at 1080p, the level of detail is impressive. The gimbal is also really easy to direct, with dials on either side of the controller to do this and it’s possible to get some really smooth panning with it should you wish. IF the gimbal gets knocked out of alignment – ours at one point was tilting at about 45 degrees after we had a fairly rough landing (user error, not the Mavic Pro), it’s easy to re-calibrate (though you have to land and set it on a level surface). The 28mm lens DJI has chosen for the Mavic Pro finds a good balance between getting plenty in the frame without being too wide so that everything is distorted a bit too much – it’s actually a similar field of view to most smartphones, while the level of control to adjust exposure goes way beyond a simple point-and-shoot compact. As well as being able to set white balance and ISO sensitivity (100-1,600) inflight, you can set the focus by tapping the screen and select whether you want to shoot JPEGs or raw files, or both, while shutter speed and aperture are relayed on screen so you can gauge if you need to boost the ISO or not. We also got to try out some of the clever tracking that the Mavic Pro’s capable of. Some of the fear for new drone users must be the thought of crashing it into some, but with the Mavic Pro’s front avoidance controls, try as we might we couldn’t get it to fly into a wall or tree – coming to a halt 15m (49ft) away. For more professional looking videos, the ActiveTrack functionality is brilliant. Set the target you want tracked (a person or a car for example), and then select either Trace (follow from behind or in front of your subject), Profile (follow alongside) and Spotlight (the Mavic Pro will keep the camera trained on your subject regardless of where you fly the drone). In the time we had with it, it worked really well and the potential to get high-end video footage that would normally require a couple of operators has to be a tempting proposition.